The following Fonts are available for engraving on most of our glassware. Please see the individual glasses to see which Fonts are available. Greek lettering is available. Note in the text box or comments box that you would like to use Greek letters and in which order. (Alpha, Beta, Delta, etc...) The 'capitalized' version will be used. Similarly, we can use Cyrillic, Hebrew and Arabic fonts by special request. We can use almost any Windows font - if you would like to use a font that you don't see below, just ask us for what you would like. If on the odd chance that we don't have that font, we will contact you before starting your order. Having trouble deciding on a font? 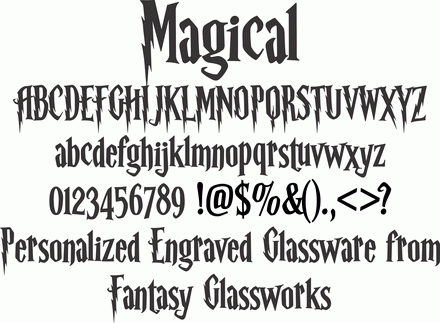 Feel free to email us at artwork@fantasyglassworks.com with your text and font ideas (and/or designs) - we can send you a proof with your text in a few different fonts, or anything else you might like.